As a homeowner, there are many different plumbing problems that you might encounter. One of the worst, in terms of residual damage caused, is a burst pipe. Today we will go over several things that can cause a burst pipe, so that you know what to look out for! Burst Pipes Are A Pain, But Our Experts Are Here To Help! Occasionally, a pipe will get broken into by a tree root in search for water. You can count on an underground leak and burst pipe if this happens. As a chance outcome, there is not much an individual can do to avert this happenstance. Burst pipes also typically occur from cold weather. Water left stationary within piping will freeze as the weather plummets. As water becomes frozen, it expands. Frozen water can lead to burst pipes in the instance of a hasty, acute freeze or prolonged cold temperatures. To decrease the chance that your pipes shall freeze, you should drip the faucets throughout cold weather. Burst pipes appear commonly due to untended pipe clogs. Clogs that get worse can cause an increase in pressure within a pipe. As the pressure rises, it will finally burst the pipe. 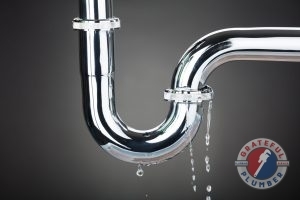 Set aside time for service at the initial sign of a clogged or slow drain to avert this consequence. To learn more, or to request speedy and affordable repairs, give us a call today at 317-677-4918! Posted in Uncategorized on February 15, 2018 at 3:03 pm by Grateful Plumber.